Teenagers in the United States are unhealthier than ever, with childhood obesity doubling in the past 30 years and 18 percent of teens are considered obese, according to the Centers for Disease Control and Prevention. Although sedentary behavior can contribute to being overweight and lead to obesity, a fitness plan can help teens keep their weight under control. Everyday activities, sports and formal exercise can be combined to create a healthy fitness plan that keeps your teen moving. The CDC suggests that teens up to age 17 get at least 60 minutes of cardio each day. Although that may seem like a lot, your teen might be getting a good heart workout without even realizing it be walking, playing sports, skateboarding, running track or even dancing. If your teen is shy about exercise, he can even use a video game that includes physical activity to complete his daily aerobic exercise requirements. Not all cardio has to be done in one 60-minute block, either -- your teen can break it up throughout the day for better manageability. While your teen doesn't have to hit the gym and pump iron daily, strength training is a component of a healthy teen fitness plan when included three times per week. Strength training can help with weight management and can include anything from body-weight exercises -- squats and crunches, for instance -- to lifting light weights. 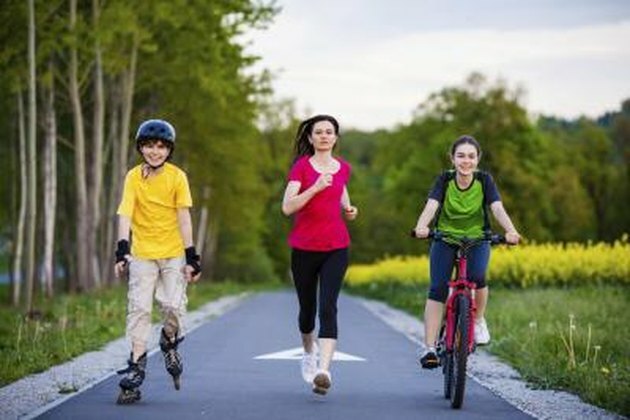 Teens should aim for between eight and 15 reps per exercise, suggests KidsHealth.org. If your teen plays a sport, strength training is often included through conditioning drills and activities, as well. Flexibility training rounds out a healthy fitness plan for teens, helping them to retain range of motion, while activities such as jumping rope help retain bone strength. Both types of activities are important for a teen's overall health. Whether it's a yoga class at school, playing a game of basketball with friends or just going for a run, encourage your teen to add both types of activities as part of his daily 60 minutes of physical exercise for a well-rounded and beneficial fitness plan. When encouraging your teen to exercise more and utilize a regular fitness plan, it's important to put the emphasis on fun and health, rather than using weight as the main motivator. Your teen might feel self-conscious about his weight, and pointing it out to him could cause embarrassment. It's also vital that when your teen engages in sports and other fitness activities, he has the right safety gear in place to help prevent injuries. After all, an injury could sideline your teen, putting him back at square one until he's able to be active again.